I’m going to be really harsh on series this week, guys, because I’m working on figuring out just what series I want to keep reading, and which ones I am not interested in continuing. You’re going to see a lot of drops in this post and on Monday’s post as I figure out just what series I want to keep reading. I really enjoyed this story, although I don’t know a whole lot about the title character. I’ve never read a Superman story before. I have seen a movie here and there (not quite sure which ones…) and I saw the odd episode of Smallville, but that’s all the exposure I’ve ever had to the Man of Steel. Like with every other, this got bonus points just for being an origin story (because I LOVE origin stories! ), but it was also told really well. I feel like the storytelling was pretty spot on, and pretty in line with a basic storyline concept that I’ve been brought up with: You start off with how life typically is (i.e. Clark trying to hide who he is but can’t stop himself from trying to help people at the very beginning), then one day something changes (i.e. he decides to stop trying to hide who he is). 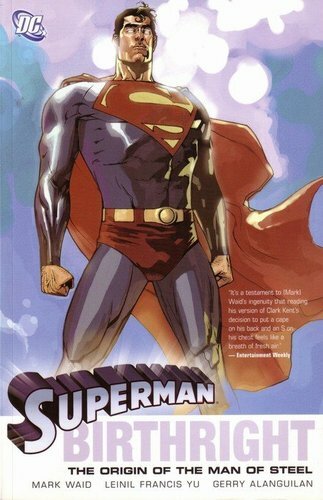 Because of that, these things happen (moves to Metropolis, gets a job at Daily Planet, meets Lois and Lex) which cause something else to happen (Lex attacking Superman’s character and launching the attack on Metropolis) and finally ends with this (Superman saving the city and redeeming himself). It’s classic storytelling, but the details and the character interactions make it an interesting read. The history behind Lex and Clark would be really interesting to read more about, and I would love to see how this dynamic ends up playing out as they move from this point in the story. I was also really enjoying what we got of Lois. I would be interested in reading more about her! Superman, himself…I’m just not sure. There’s nothing wrong with him…I just don’t really find him all that interesting on his own. Still, this story is well worth the read! And just when you think you might get to the main plot, you get…more set-up. Come on Hickman…you’re killing me here!! It feels like we’re leading up to something amazing…but the leading up part is taking so long! I spent quite a lot of time on Wikipedia looking at the various universes of the Marvel multiverse, trying to see if any of the universe/station numbers at the very beginning of the story corresponded to a known universe. Other than 616, I didn’t see any. I’m really curious about the only other universe that looks like they might have gotten a signal out, so they may have also had their own white event, Universe 3281809. I can’t find any mention of it anywhere, so it’s probably not a universe that has been visited before. Artwork wise, we changed artists again. I’m sure this is going to be really common, especially for a title thats released twice a month. This specific team I liked, though. I though the art and the colors were wonderful. It looks like we keep them for at least the next issue as well, which gives me yet another reason to look forward to that one! 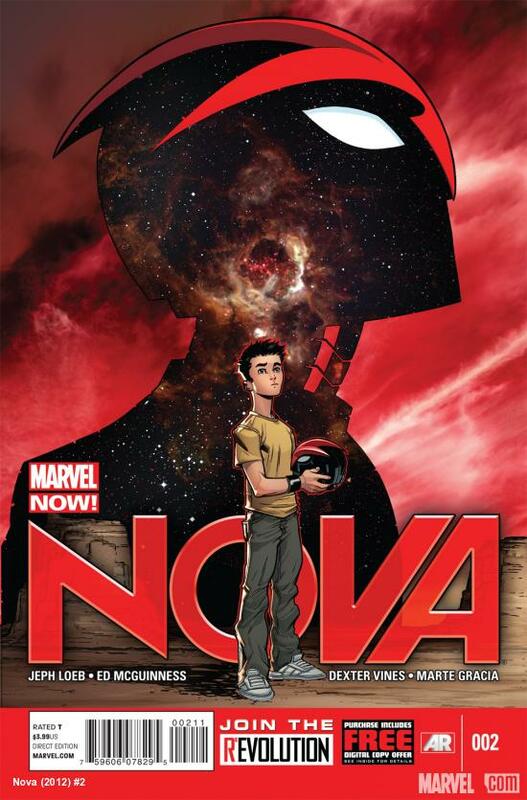 Overall, I enjoyed this issue…but the series as a whole just has me going crazy! I want more…and I want to understand what is happening! And so far, all we’ve had are little clues and random events that seem connected but its hard to figure out how or why all of this is happening. I’ve got guesses, but nothing concrete. If Hickman was trying to drive his readers insane, he’s doing an amazing job of it! This is the last of the Avengers for a while! I’m finally caught up with all the series that I had a large backlog to get through!! Whew! Almost done with everything from the first week too, so hopefully I can start getting to new stuff in the next day or so! In terms of the main storyline, there isn’t much. We see that Stark is working on translating what Adam (who his now calling himself Blackveil) is saying. The most interesting part was the very end, when they were trying to find out why the Empire was attacked, only to realize their attackers were not trying to invade. They were running from someone…no, that’s not ominous at all! Definitely curious to see if this thread gets picked up and where it might lead. 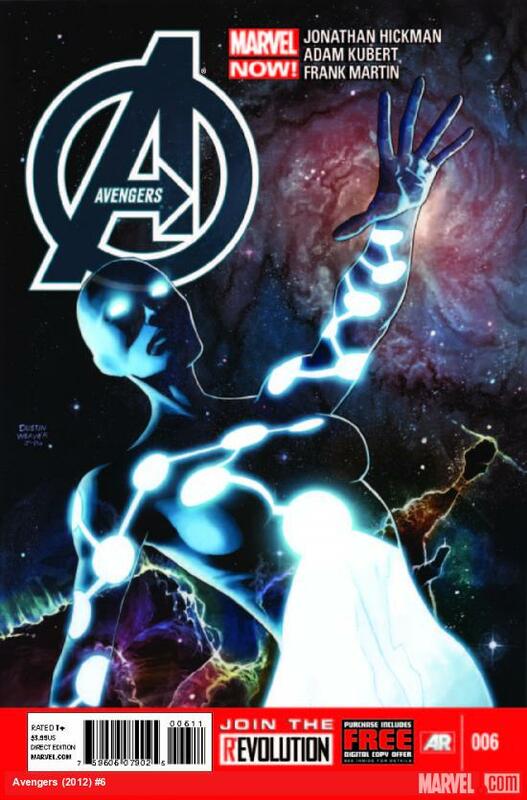 Avengers #6: This issue focuses on Captain Universe and the woman who was taken as host, Tamara Devoux. Honestly, though, that wasn’t the interesting part of the issue. 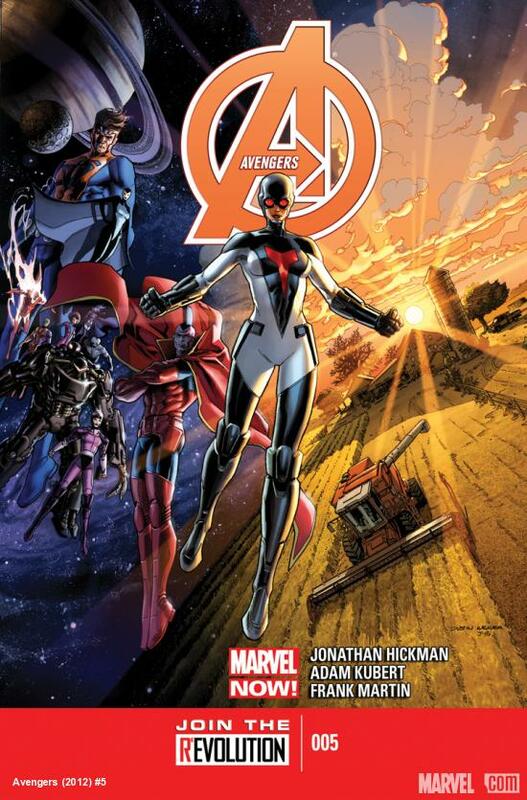 While it was nice to learn exactly what she was, and parts of the reason why the Universe decided to take her as a host (going into Light, both of them dying – anyone else seeing New Avengers connections to that statement? 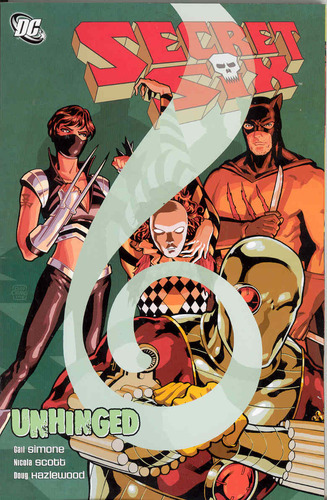 ), it felt a little flat, and I was really reading through that to get to the other parts of the issue. The little side-story involved Ock/Spiderman taking food from Sunspot and/or Cannon Ball (I’m not quite sure which one is which at the moment…they tend to travel as a pair…). There’s a bit of an argument, where Ock doesn’t seem to be even remotely trying act like Peter, and then we head out to Stark, who is still working with Adam/Blackveil, trying to get a translation program down so they can understand him. But he doesn’t seem to be having any luck. They are then joined by Captain Universe, who can not only understand Adam/Blackveil, but can speak back to him. She shows Stark where he went wrong with his translation, then somehow makes it so that Adam (who’s actually been calling himself Nightmask all this time…) can speak in English. I’m not sure I like Captain Universe all that much in terms of storytelling…she just seems to jump in and fix things without any real explanation…just a snap of fingers or a few choice words, and everything is okay….like a perpetual Deux Ex Machina character. Anywho, Adam/Nightmask’s first words to the group are ominous enough – there is a “White Event” that is coming – but at the same time, the sky changes colors, and there is something streaking toward earth. Oh yes…very ominous! I like the issue well enough. I can’t say I’ve really enjoyed the Mars trio all that much, but it was a good set-up to explain the premise and everything else that was going on. I’m just hoping that, after this, we start to get into more of the main storyline! 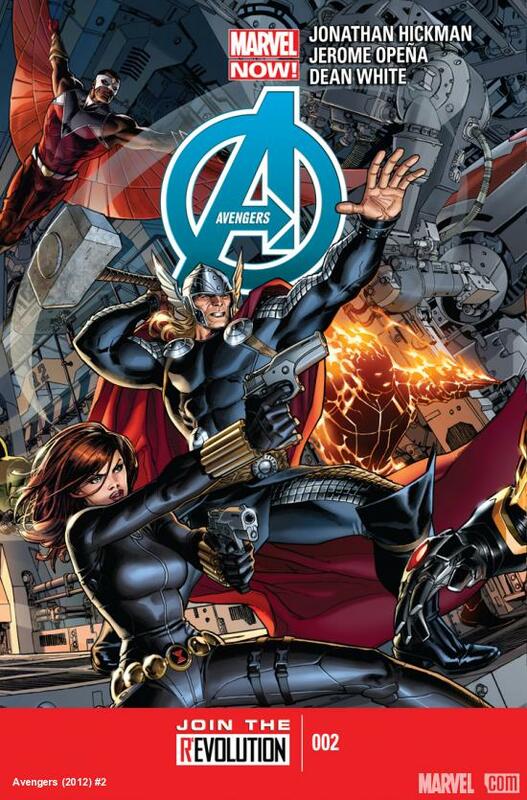 Avengers #4: We really have a clean-up job ahead of us, don’t we? The six (seven?) origin bombs that Ex Nihilo sent down seem to be half of the focus of this issue. We’ve got five of the sites found and contained (as well as these things can be contained, I suppose. They don’t look that contain-able) and, in the course of the first few pages, find a sixth site in the Savage Lands (can someone please explain the Savage Lands to me? Its shown up in two different comics so far, and I’m not quite sure what it is. As far as I can tell, its a weird little section of land that may or may not contain dinosaurs). A subest of the group heads out that way to contain that site, and they run into a group of scientist from A.I.M (another group that seems to span from series to series…) who have, for some crazy reason, decided to extract some material from the pods in these infected areas and inject them into someone. That someone dies, then sprouts tentacles that start attacking the group. The storyline above was interesting enough, but the part that I really enjoyed was the focus of the other half of this issue – a history of Hyperion. Maybe this is something other people would know if you’ve been reading for a while (I’m not certain how prominent he was prior to this) but I really enjoyed the history lesson. It endears you to the character just a little more, so he’s not just a face who’s name I don’t know. Well, at least it’s what I’ve been waiting for! 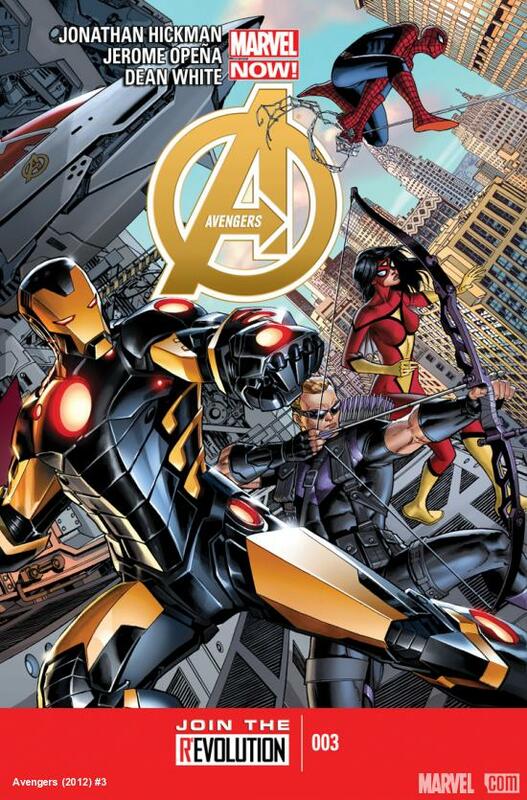 Avengers was one of the main series I wanted to pick up from the get-go. Unfortunately, my comic store was out of issue #1, and the only restocked last Wednesday. So I finally got to read the series that I had been wanted to pick up from the beginning! Avengers #1 – Interesting way to start a new comic, with so much foreshadowing I’m not sure which piece to look at first. There was talk of wars and falls and dying moons…I’m not sure if any of this was supposed to have happened in the past, or something that we’re supposed to be looking forward to. It’s hard to tell. But I liked the initial exchange between Stark and Rogers and their whole idea of getting bigger, though there were other things happening in that exchange that were a lot more interesting…and I’ll get to those later. Then, we rather suddenly jump forward a month and suddenly we’re on Mars with a rather strange trio of characters that are throwing…mini terraforming blob things…down to earth in order to remake it. Not quite sure why…and not quite sure why the robotic one seems more interested in destroying the world instead. Anywho, a blob is hurled at earth, and I guess the Avengers were waiting for it because they appear and destroy it before it reaches earth. Then they land on Mars and have a really quick battle which ends in everyone beaten except for Hulk, who’s been enchanted to follow the trio instead. Then Cap is sent back to earth and puts out a call to the others that Tony and Steve had been talking about earlier. In that initial opening exchange between Tony and Steve, when Tony wakes Steve up, Tony asks if Steve was having a bad dream. Cut to a panel where there are four people in a black room standing above our Point of View, two of which are Reed Richards and Black Panther. 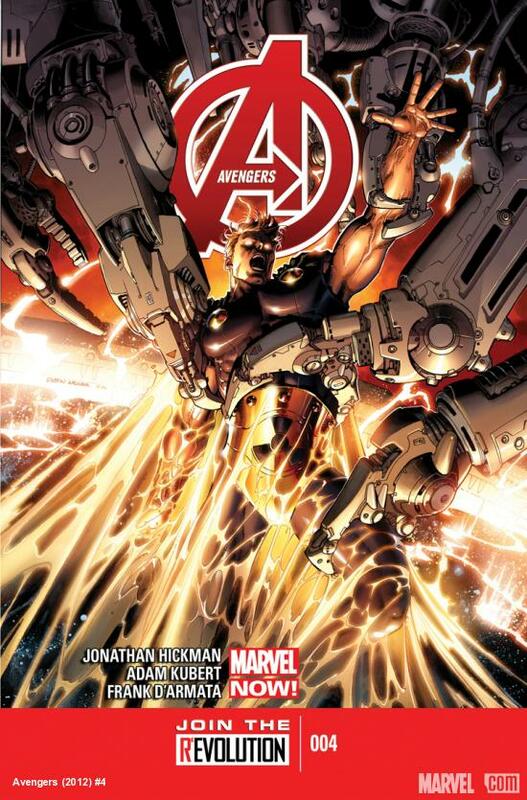 The scene is eerily familiar to anyone who’s read New Avengers #3, becuase that’s about how that issue ends. Now, of course, I can’t know this for sure. There’s certainly no other evidence of a connection and I’ve only heard whispers that these two series are related, so I don’t have a lot to go on here, but lets suspend disbelief for a moment and just assume that’s true. 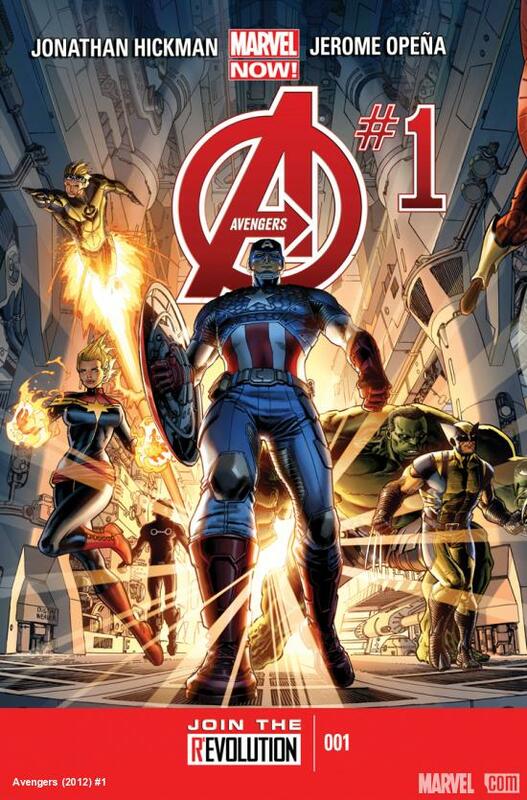 Which means the beginning of Avengers #1 happens sometime after New Avengers #3. Cap’s memory has been wiped, but apparently there’s enough left that he still sees the scene in his dream. 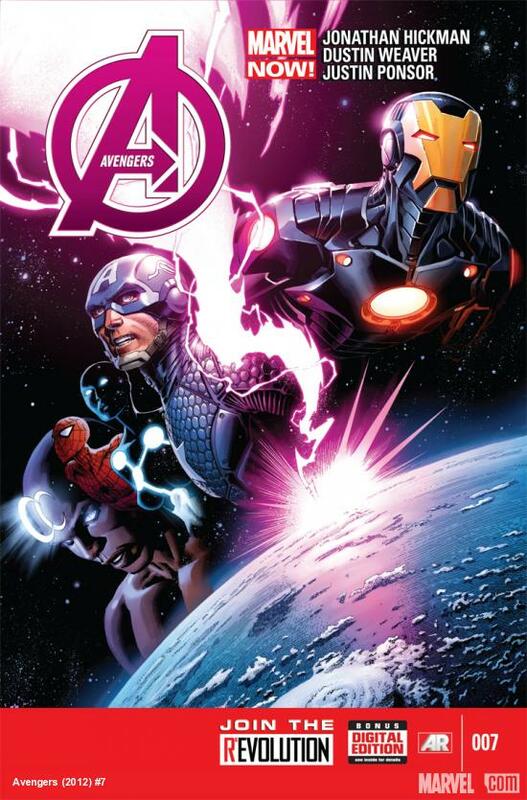 My guess is that this would be pretty soon after the end of New Avengers #3, maybe even the evening after. That would help to explain why Tony can’t sleep, given what else is on his mind. And, given what they’ve all just been through, expansion would actually be a good idea, cause who knows when the world is going to try and come to an end again and he may need to be gone? Of course, who knows if any of the above is true. I certainly don’t. But the possibility is enough that I want to keep reading, just to see if there is something to that silly extra panel! All in all, I was not horribly fond of this issue. I mean, it did what it had to do, in that it gave us all the background that was missing from Issue #1. It just felt like it was all stuffed into one little place, just to get it out of the way. I’m not usually a huge fan of that form of storytelling. Is this common for Comics though? To have one giant issue to explain the background of what got us to this point? Or does that vary by author? I’m not quite sure what the convention here is. Since I didn’t talk about it with the last issue, I should talk about the artwork a bit as well. I like the artist does human faces. I always think they look good and interesting. I think he does people well. Not as big of a fan of anything else, though. It’s not bad…it’s just not what I would rank among my favorites in terms of artwork.